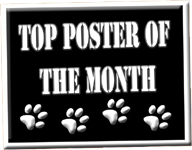 Congratulations to @Alice Kable for being our Top Poster of the Month! Keep up the great work! WOW!! Come on guys, that's 2 months in a row. Post away!!! Thanks, David, but I'd really like to see it go to somebody else this month!!! Just shows how much you love frenchies and buster! That is so true, Lisa! I am totally smitten!